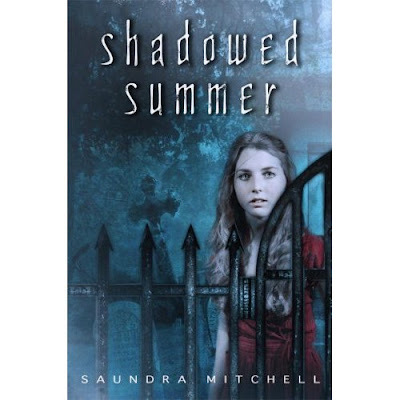 I'm sooo excited to share my interview with the super-hilarious, awesome and talented Saundra Mitchell! Sell us on SHADOWED SUMMER. Why should we rush out to grab a copy right now? Because it's February, it's 15 degrees outside, and you would love nothing better than to nap beneath the sweltering shade of an oak tree so exhausted, so old, that there's a good chance the S+W '28 carved into a heart on its trunk was left there by your great granddaddy when he was courting somebody besides your great granny. Forget about winter- it's time for summer to begin! What’s your fave part about writing? Least fave? I love the going-away time, when I actually leave my desk and slip into the world I'm writing. It feels like a physical leaving- but it also leads to my least favorite part, which is ending the book. That moment when I realize I can revisit the story, but I can never live *in* it again, that's really hard. You’re also a screenwriter, which fascinates me. What was the transition like from screenwriter to novelist? What are the benefits of being a screenwriter when you write a book? I haven't exactly transitioned; I'm doing them both! But the nice thing about switching between them is that they're such different forms. Which is where you're going along happily, setting the scene and then BAM, something really awesome happens. You get to capitalize it, and put it on its own line, and there's no mistaking just how wicked sweet that moment is. It's in a break out! POW! And though I miss things like that when I'm working on a novel, novels let me talk about how people feel. I get to be the actors and decide how a scene plays out- whether this break up is furious, or rueful, or weary. I get to be the director- are we looking through a window, or looking at the main character's hands? I get to decide! Should be. I'm still learning the craft and reaching for the art of writing prose, but sometimes, the screenwriting tricks help me find the heart of a scene. You know, Nate Archibald is cute. He's a pretty good guy with a functional moral compass... and that's why I'm obsessed with Chuck Bass. Chuck is every reprehensible lizard-brain impulse you could possibly have, walking around in mint-and-pink Bermuda shorts. He's *awful*, he's shameless, he's so badly behaved! And I love that- as long as he's safely contained on TV. If they were real people, though, I'd spend my time with Nate, no question! What are you reading now? Why did you choose it? Right now I'm reading an advance copy of Deva Fagan's "Fortune's Folly"- I was super lucky, this book chose me! The author sent me my very own signed copy, and my daughter and I are enjoying it immensely. I'm also reading Jonathan Carroll's "The Ghost in Love." I heard it was good, so I got it for my mother for Christmas. Unfortunately, something about it totally annoyed her, so now she's making me read it to guess what that was. You work with many young writers. What’s the biggest misconception editors or agents might have about young writers subbing to them? Every single teen I've worked with in my screenwriting program- wow, you know, they're talented just to be selected. But they're so serious about their careers- it's not playtime for them, they're completely professional. They take critique like pros, and their solutions are inspired and fresh and so exciting. They surprise me again and again, so my advice would be- if you've got a submission from a teen that's so-so-so close and the only thing holding you back is their age- give them a chance. I think they'll surprise you, too! What are you working on now? Give us the scoop! I'd love to say, but I can't yet. Soon, I hope! Unless you meant extra-professionally, in which case, I'm working on talking all the awesome authors I know into working silly secret additions into their future books. How do you feel about temporary horse tattoos, Jessica? JB note: I'm *so* there! Wanna get one with me? "Hey, Saundra, how does it feel to win the lottery?" I might have to win the lottery first, though. Hmm. No wonder no one asks me that. Thank you, Saundra! For more, visit Saundra's Website and check out her blog. And if your readers enter with the special code DRESSAGE after their name in the entry box, I will give them DOUBLE entries into the sweepstakes! Go enter to win! :) Good luck! Very impressed by her answer in regards to young writers and how professional they are. I'd like to add that editors shouldn't hold old age against someone who is writing for children! LOL!